The Embraer EMB.110P Bandeirante is a twin-engine transport aircraft for up to 19 passengers. The EMB110 was evolved from the IPD/PAR-6504 program set by the Brazilian Ministry of Aeronautics in 1965. Project IPD/PAR-6504, by the Research and Development Institute / Aircraft Bureau (Instituto de Pesquisas e Desenvolvimento / Departamento de Aeronaves IPD/PAR), was intended as a light military transport aircraft. Development of the successful EMB110 started when a design-team under the leadership of the French engineer Max Holste designed a general-purpose aircraft, suitable for both civilian and military roles with a low operational cost and high reliability following the specifications of the IPD/PAR-6504 program. The first of three YC-95 prototypes built, YC-95 2130, made its maiden flight on 26 October 1968. The three YC-95 prototypes were quite different from the resulting series production model. The forward fuselage and the tail unit were modified, and the two original 410kW Pratt & Whitney Canada PT6A-20 turbine engines with three-blade Hamilton Standard propellers were replaced by 570 kW Pratt & Whitney Canada PT6A-27s with Hartzell propellers. In 1969, Embraer, the Empresa Brasileira de Aeronáutica S.A. was established by the state, and development and production of the C95 became one of the company's first responsibilities. The modified aircraft went into production in 1972, with the first production standard EMB110 Bandeirante (Portuguese for Pioneer) flying on 9 August 1972. Deliveries of the C-95 to the Brazilian Air Force commenced in January 1973. The civil EMB110C 15 seater was certified soon after, and on 16 April 1973, the EMB110 entered airline service with TransBrazil Airlines. There are twelve versions of the Bandeirante, or 'Bandit', including the EMB-100 prototype, the EMB-110 original production model, the EMB-110A radio calibration aircraft, the EMB-110B aerial survey version, the EMB-110C quick-change passenger transports, the EMB-110E executive, the EMB-110K military transport, the EMB-111M and N maritime patrol version, the EMB-110P commuter airliner and the EMB-110S1 geophysical survey platform. Production of the Bandeirante ceased in May 1990 with 500 aircraft completed (469 EMB-110 and 31 EMB-111) and delivered to civil and military operators all over the world. F'Airlines was established early 1995 as successor of Twente Airlines and operated a number of EMB-110P Bandeirantes and four Reims Cessna F.406 Caravan IIs. These feeder liners were operated on the scheduled services Enschede-Amsterdam and Groningen-Amsterdam. The Groningen-Amsterdam service was flown first on 30 January 1995, first five times a day. Due to the succes of the line, the number of daily roundtrips increased to six in 1998. In autumn 1998, F'Airlines was integrated in KLM Exel and flew its last regular services on 24 October 1998. In November 1998, KLM Exel decreased the number of flights on both services to three times a day. Within six months KLM Exel stopped the regular services. 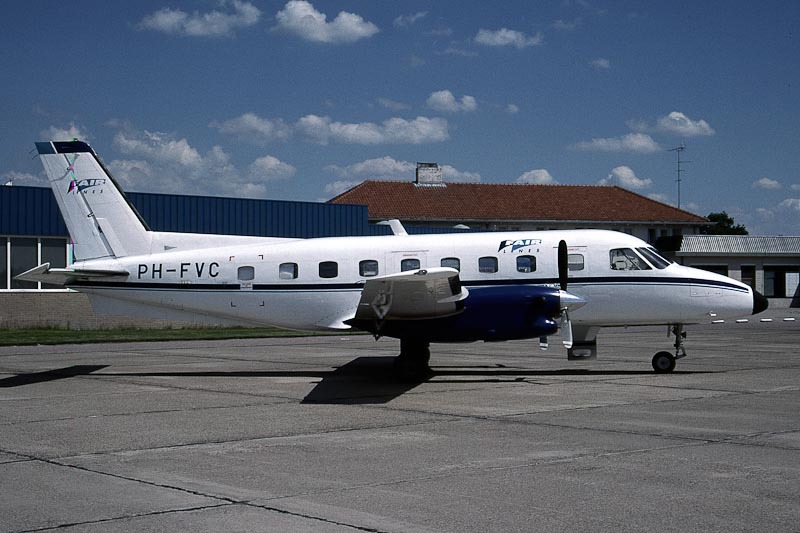 The 1979-built Embraer EMB.110P1 Bandeirante c/n 110-217 was registered PH-FVC in the Netherlands with F'Airlines BV, Enschede, as operator and Eurolease NV, Belgium, as owner on 12 February 1997. The aircraft was registered before G-BNIX, N8536J, XC-DAB and PT-GMJ. On 22 January 1999, the Bandeirante was registered with to Sky Service bvba, Wevelgem, Belgium, as operator and Eurolease SA/NV, Belgium, as owner. Registration PH-FVC was cancelled on 7 February 2000 and the aircraft was registered the same day in the UK as G-ODUB with Comed Aviation Ltd., Manchester. On 9 October 2002, registration G-ODUB was cancelled by the CAA and the aircraft was brooken up at Southend in August 2003.